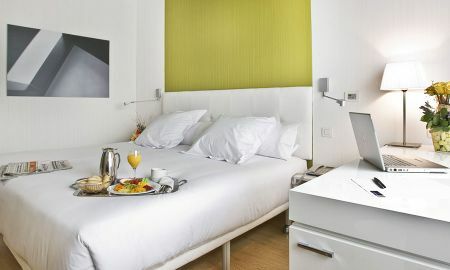 Located in Madrid's fastest growing business area, Occidental Castellana Norte is a functional newly-built hotel ideal for business and leisure travellers alike. 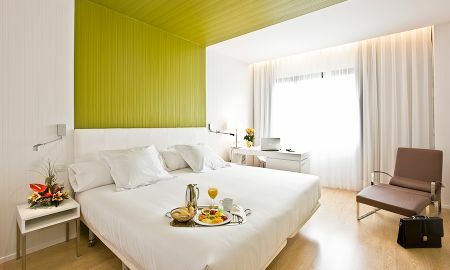 Bright and comfortable, the hotel's 144 rooms are especially designed in a modern style and fitted with exclusive services to guarantee you an enjoyable stay in Madrid. “Neptuno” restaurant is a warm space serving delicious Mediterranean cuisine prepared with the freshest products to delight the most discerning palates. Located on the ground floor, “Cibeles” lobby bar offers a complete menu in a cosy atmosphere ideal for having a drink while working, reading newspapers or chatting with friends. The 3 large, open-plan meeting rooms, with capacity for up to 200 persons, provide the latest media and audiovisual systems to guarantee the success of all your meetings and special events. Located in the “Nudo Norte”, Occidental Castellana Norte is easily accessed via the main highways (A-1, M-11, M-40, M-30 and R-2) 3 minutes from the Corte Inglés Sanchinarro shopping centre, 5 minutes from Juan Carlos I Exhibition Centre (IFEMA). Due to the nearby train station Fuente de la Mora, you can reach the city center respectively Terminal 4 of Barajas airport in only 7 minutes time.